When I first arrived at the Kellogg Biological Station (KBS), I didn’t know what to expect. I had never heard of KBS before applying, could not have told you REU stands for Research Experiences for Undergraduates, and had no clear path for my future. As a rising junior at Calvin College, I recently discontinued my pre-med track. I remained a double major in biology and biochemistry, and I came here to explore a new area of science. I arrived a day early and moved in alone, while it rained, hoping it wasn’t foreshadowing the rest of my summer. I’m pleased to say it wasn’t. 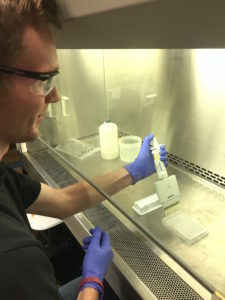 KBS REU Harry Ervin multi-pipetting for an ecoplate assay. I soon met my advisor, Tayler Chicoine, and the rest of Dr. Evan’s lab. The atmosphere of the lab was friendly but hardworking. In the first week, I found myself researching potential projects and learning the methods behind research design. We decided on a main project concerning the effects of nitrogen competition on plant-plant interactions and plant-microbial interactions. Nitrogen is important because it is a key limiting nutrient in most terrestrial ecosystems. Plants have developed many strategies to deal with nitrogen limitation including a carbon (sugars) – nitrogen exchange with bacteria. We used switchgrass as the key study plant for this research, which is part of the Great Lakes Bioenergy Research Center’s sustainability research on biofuels. Switchgrass has potential as a bioenergy crop and is also known to have symbiotic relationships with nitrogen-fixing bacteria. These bacteria can convert atmospheric nitrogen into a more usable form in exchange for sugars provided by the plant. I predicted that switchgrass plants growing near different species of neighboring plants would experience varying levels of nitrogen competition that, in turn, would trigger switchgrass to recruit distinct bacterial communities that could assist in their N-competition. However, as the project continued to develop, so did our summer timeline. We had to alter our methods several times before we got things to work due to germination and time issues. This troubleshooting encouraged me to develop my own side studies on germination and microbial communities’ carbon use. Beyond my independent projects, there was plenty to learn outside of the greenhouse. Our lab conducted weekly meetings to discuss scientific papers. Seeing how more experienced scientists analyze, discuss, and critique scientific literature was an incredibly valuable experience. I also increased my lab and fieldwork skills while helping with a larger project’s field sampling. Finally, KBS held a weekly professional development course to hone skills such as writing, research outreach, poster drafting and more. We even went on a tour of Michigan State’s graduate school and could ask administrators and faculty questions about applying to the school and what it’s like to be a graduate student. 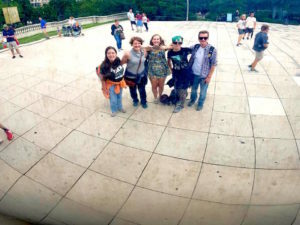 KBS summer students Sophie Berry (left), Amy Wrobleski, Elizabeth Postmen, Ayley Shortridge, and Harry Ervin taking a selfie with “the Bean” in Chicago. Of the resources provided by KBS, I found meeting with visiting ecologists and KBS faculty to be the most helpful. KBS brings eminent ecologists to talk about their research and experiences. Group and individual meetings with these scientists and KBS faculty were invaluable experiences which encouraged my decision to pursue graduate school. Their approachable nature and honest and experienced answers broadened my awareness about graduate school. Although I was busy conducting research and advancing my professional skills, there was always something fun to do at KBS. I spent a lot of time wandering the seemingly endless hiking trails, canoeing/kayaking, riding my bike around the lake, sitting by the camp fire, and enjoying our weekly movie nights. KBS also arranged trips for the students, including a camping trip to Northern Michigan and a day in Chicago! I had an amazing time on the Chicago trip. We spent the first half of the day in a behind-the-scenes and a highlight tour of the Field Museum. I spent the rest of the day visiting the exhibits and exploring the town and local parks and attractions. In summary, although I began this summer with an immense feeling of uncertainty, I have learned more than I ever thought possible, found my place here, and am working toward my future. 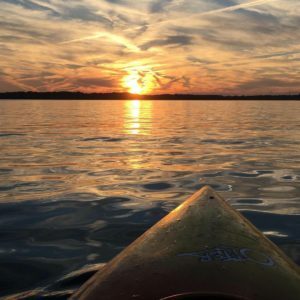 Sunset while kayaking on Gull Lake.